My normal breakfast consists of toast and coffee. Occasionally, I’ll have leftover rice with scrambled eggs. Boring, I know. Probably not the healthiest way to start the day off either, but I’m not really a breakfast eater … except on the weekends. Even then, I think it’s more about eating with my family and spending time together. I think the Mister and kiddos look forward to weekend breakfasts too. A few months ago, I really wanted a donut pan and my husband was nice enough to get me two of them. We tried a few recipes and they were all good … but this one blew them all out of the water. If loving a donut is wrong, well, then I’m wrong. 😉 The folks over at insidebrucrewlife really know a thing or two about making Chocolate Mint Donuts! 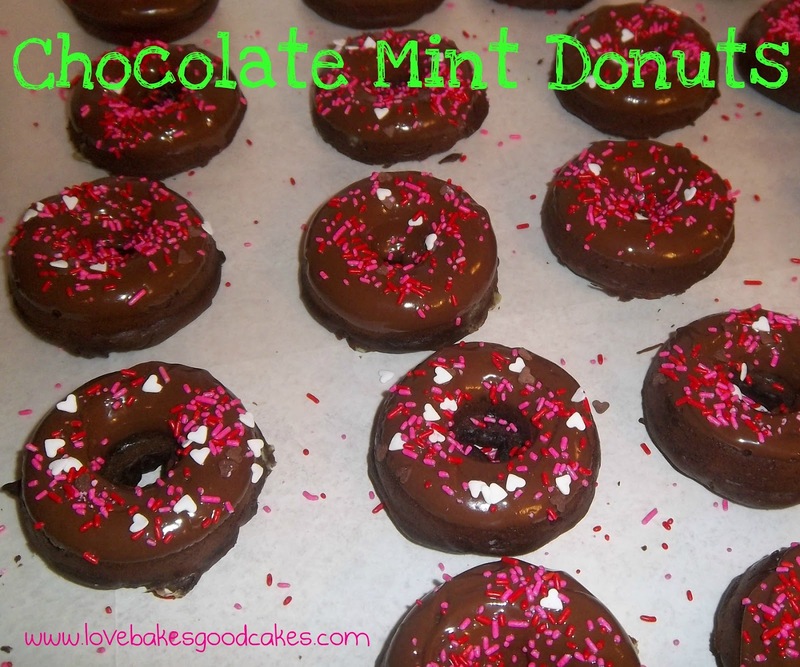 Seriously, these are perfect … minty and chocolaty ….. “cakey” and delish! The only reason I subbed Mint Chocolate Chips was to avoid making an “extra stop” for one item. I just don’t have the time patience to drag four kids into a store for one thing if I can avoid it. If you’re ever wanting to make donuts, make these! Make the extra trip for fudge mint cups if you wanna, or just use regular ol’ mint chocolate chips. Either way, be prepared to fall in love! Preheat oven to 425 degrees. Cream butter, vanilla, and sugars. Add the egg, sour cream and buttermilk and beat again. Combine all the dry ingredients and slowly incorporate them into the butter mixture. Stir in the andes chips by hand. Fill donut cavities at least 3/4 full. Bake 9 minutes. Let sit in pan for about 2 minutes, then remove to wire racks to cool completely. Melt mint fudge cups with 1 Tbsp. shortening. Stir every 30 seconds so it doesn’t burn. Dip tops of donuts into the melted mint. Sprinkle with desired sprinkles, jimmies or sugar.